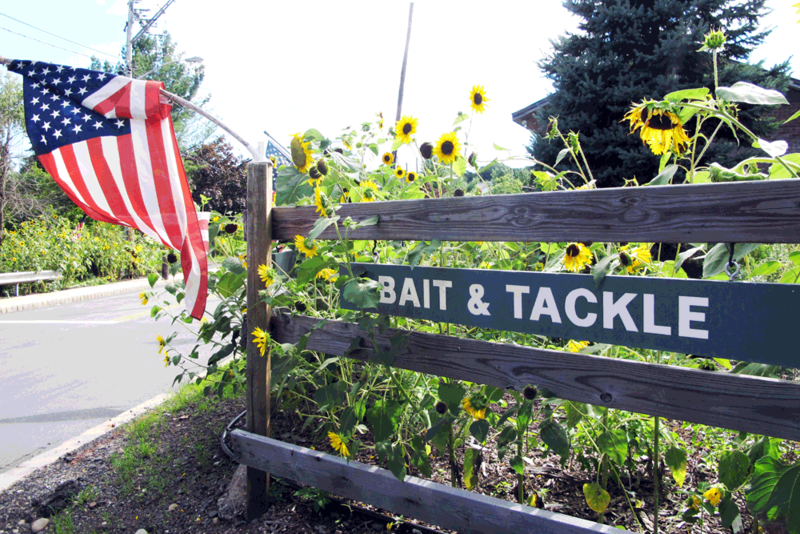 Tarrytown Environmental Advisory Council is dedicated to improving car-free connections within our village and beyond. We take the reduction of car traffic — and greenhouse gas emissions — seriously, and many of us use our bikes more than our cars. Tarrytown’s bike paths are a gift, and unique in the state of New York. No single village in the state has as many dedicated bike paths and connections to more bike paths. And by the time the Empire State Trail opens in 2020, and the shared-use path across the new Tappan Zee Bridge opens in 2019, the reach of these pathways will grow wider still. Trailside in Palisades, New York. From Tarrytown, you can access more than 100 miles of paved, off-road bike paths and not-so-paved packed earth routes. You can combine a trip across the new Tappan Zee Bridge (opening in 2019) with a visit to Nyack, and from Nyack continue south on the Esposito Trail to Piermont, or go north to Haverstraw along the edge of the Hudson River. Or, from Tarrytown, go north to Brewster and catch the train back to the city — or further north to more bike path. Tarrytown’s not just a place to bike from, but a warm, wonderful, restaurant-lined village that’s great to come back to before heading home. Have a local brew at Little B’s or The Tapp. Grab delicious “fast casual” tacos at The Taco Project, or BBQ from Piknik. Pull up a chair at any of the sidewalk restaurants and cafes, and just hang out. Discover the tucked-away scene on the pier at Barley on Hudson, or the Washington Irving Boat Club, where you can have a cheap gin and tonic in a plastic cup to go with your unsurpassed views of the new Tappan Zee Bridge. North County Trailway: 22.1 miles, paved, flat. Suburban to country, shaded. Leaves from Tarrytown, connects to Putnam County Trailway at the north end, and South County Trailway and Tarrytown Lakes Extension at the south end. Will soon connect to Bronx River Pathway via new Tarrytown Kensico Trailway (still in the planning stage). South County Trailway: 14.1 miles, paved, flat. Suburban, shaded, flat, but completely unbroken, scenic, car-free paved trail. North end is in Tarrytown and connects to North County Trailway and Tarrytown Lakes Extension Trail. South end dies in the woods at the north end of the Old Put trail in Van Cortlandt Park, for which a hybrid bike or mountain bike is best (though a road bike can navigate if it’s not too muddy). Will soon connect to Bronx River Pathway via new Tarrytown Kensico Trailway. Tarrytown Lakes Extension Trail: 2.1 miles; paved for one mile, wide cinder/dirt for 1.1 miles: Pretty lakeside trail that embraces both sides of the Tarrytown Lakes. It leads to the North and South County Trailways, connecting riders to village of Tarrytown, the Old Croton Aqueduct and the Riverwalk. Old Croton Aqueduct Trail: 22 miles; unpaved dirt track over historic aqueduct in Westchester County: For the hybrid or mountain bike, this is a level track through the shaded backyards, forests and fields of western Westchester County. Beautiful, historical, fascinating. Shared Use Path over Tappan Zee Bridge: Set to open in 2019, this car-free pathway will open a world of options for cyclists by connecting Tarrytown, and points north as far as Millerton, to the other side of the Hudson. Even a trip from Massachusetts to Liberty State Park in New Jersey will be possible using mostly car-free bike path. 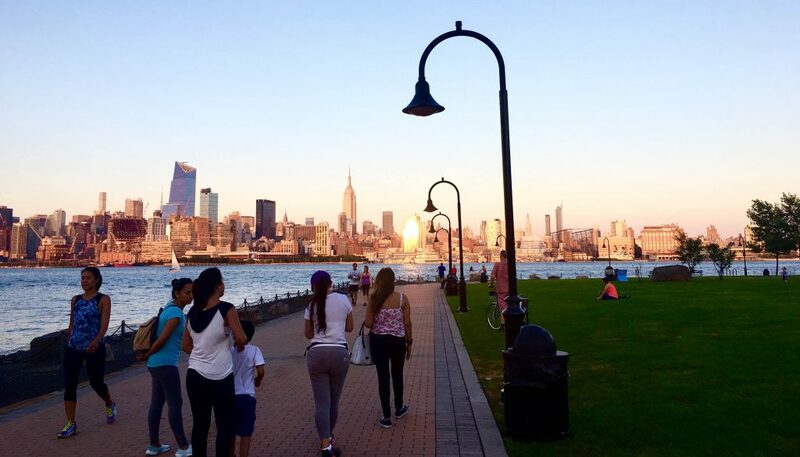 The view from the waterfront in Hoboken, New Jersey. When the shared-use path across the Tappan Zee Bridge opens in 2019, cyclists can ride from Tarrytown to Hoboken almost entirely on paved, dedicated bike path.